Special Counsel to Question South Gyeongsang Gov. For Second Time Thurs. 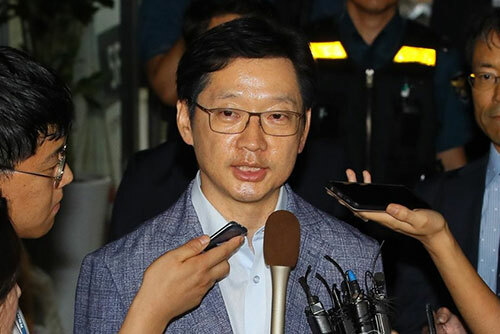 Special prosecutors investigating the online opinion rigging scandal involving the blogger "druking" will summon South Gyeongsang Province Governor Kim Kyoung-soo for the second time Thursday. The team led by Special Counsel Huh Ik-bum said it plans to summon Kim at 9:30 a.m. to continue questioning him on charges of obstruction of business and violating election laws. During the first round of questioning earlier this week, Kim is reported to have denied all the allegations against him. Kim is also suspected of attending the blogger's demonstration of a computer program designed to rig comments in November 2016, and offering the Osaka consulate general position to "druking" last December in exchange for seeking the blogger's support during this year's local elections.